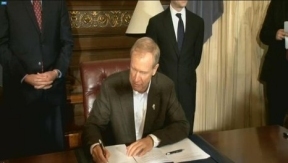 A second legislative bill was signed yesterday by Illinois Governor Bruce Rauner–introduced and passed on behalf of the Vision 20/20 group–ensuring a balanced accountability measure focusing on continuous improvement, recognizing the diversity of struggling schools and aimed at eliminating achievement gaps across the state. The model adopted under HB2683 (now Public Act 99-193) allows local flexibility, promote shared accountability, and is sensitive to local district improvements. The passage of this bill marks the second legislative victory for a collective group known as Vision 20/20. The group consists of the four largest education associations in Illinois along with the Regional Offices of Education (ROE’s) and the Superintendents’ Commission for the Study of Demographics and Diversity (SCSDD). Just last week, the governor signed a bill (HB 2657/PA 99-58) designed to streamline the licensure process for teachers and administrators and establish reciprocity with other states in order to increase the pool of qualified candidates for positions in Illinois. The Illinois Balanced Accountability Measure (IBAM) implements an accountability model for schools that in addition to using standardized test scores also provides flexibility for school districts to use an evidence-based framework to demonstrate student improvement and growth. The group worked with the Illinois State Board of Education (ISBE) in arriving at the final agreed-upon language. For more information, please visit http://illinoisvision2020.org.